This delicious dessert combines an airy sponge with lemon curd and whipped cream. 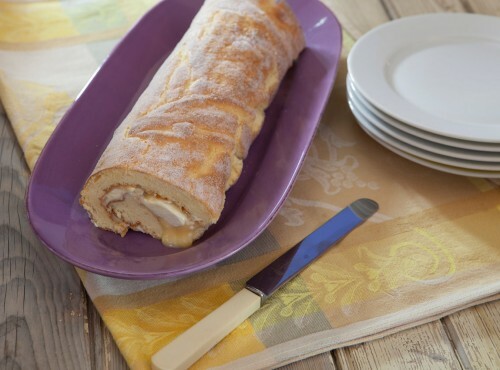 Serve the roulade as soon as possible after filling: it is a very soft dessert and does not improve with sitting around, but the texture will be ruined if it is refrigerated. To make the lemon curd, whisk egg yolks and sugar until well combined but not frothy. Tip into a heavy-based non-reactive saucepan and add butter, zest and juice. Stirring constantly, bring to simmering point over a medium–high heat (about 5 minutes). As soon as bubbles appear, remove from heat, still stirring. Allow to cool. Preheat oven to 180°C. Line a 36 cm x 26 cm Swiss-roll tin with baking paper. Generously brush paper and sides of tin with melted butter and dust with a tiny bit of flour. Beat egg yolks, flour and lemon juice with sugar until pale and thick. Fold in zest. Beat egg whites to form stiff peaks, then fold lightly but thoroughly into egg yolk mixture. Spoon into prepared tin and smooth top. Bake for 15–20 minutes. When springy, remove tin to a wire rack for 10 minutes, then turn cake out onto baking paper sprinkled with sugar. Gently peel away baking paper. Allow cake to cool, then spread with 1 cup lemon curd. (Unused portions of curd can be transferred to sterilised jars and sealed.) Roll up, using paper to help you. Dust with icing sugar before serving with whipped cream.